We are back with Part 2 of Super Motivational Quotes by Dr. Kiran Bedi. Dr. Kiran Bedi is the first female Police Officer from India and the highest ranking one has well. Throughout her career she exemplified courage and was known for her honesty. 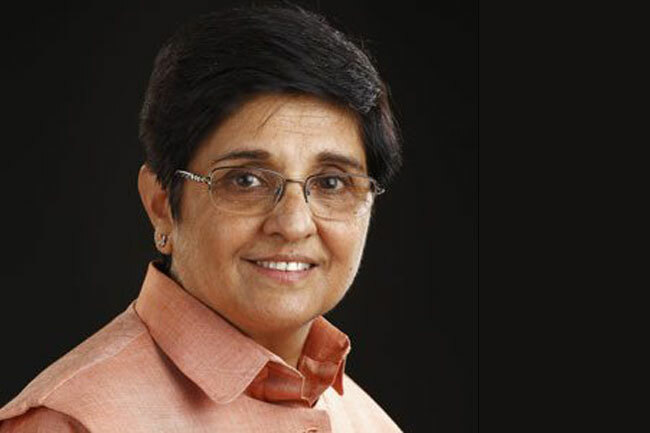 Kiran Bedi became a role model to hundreds of thousands of women all across India. After her retirement, she also became a social activist, an anti-corruption activist and a politician. She is also a best selling author and the recipient of numerous awards, including the United Nations Medal and the Ramon Magsaysay Award, which is almost an Asian Equivalent of a Nobel Prize. If you know the road map and you are organized to walk the journey and you have faith in yourself then others may say yes or no, you decide for yourself. Either you listen to yourself or you listen to others, you will have to make the choice. Success is not one time. Success is each day, each living, each thought! Success is not a trophy that you just put somewhere. It’s joy, it’s happiness! I knew I’d make it great. This was my domain. I had the passion here, and the heart here and the willingness to serve. So I was never in doubt and it’s not a question of doubt never appearing, I was just raring to go! Sometimes you should trigger yourself! Sometimes get into a situation where you are getting humiliated, only to shame yourself saying why couldn’t you do it?! None of the doers have ever been told what to do, they do it themselves and that’s why they become examples to others! The clarity within one’s own self of what one wants, setting up realistic goals and then following those plans one day at a time is important. I saw the consequences of economic dependence, psychological dependence and mental dependence. I hated dependence! Why do we take success as a destination and a full stop? There is no full stop! It’s the mind that helps you make better choices but you’ve got to store better thoughts in there too. Good reading, good thinking, personal reflection, and a good creative environment generate innovation, generate new thoughts. And it’s the new thoughts that give you new directions. I hated being ordinary! I disliked being ordinary, because I looked at the ordinary woman’s life then and found it was hell, it was drudgery! A person who is grateful will always have friends, people would love to be around him. All the people who reach the peak are not really the best. Anybody who reaches their own level of Everest and they are happy with it, so be it! The beautiful part about the human mind is that it expands, it really has no boundaries. So whenever you listen to something good, it impacts you. It gets stored in the mind and you never know when something triggers and it awakens! I have never been afraid of authority, right from school. Courage was reinforced at home. It started with small victories like addressing eve-teasing and went on to tackle larger issues. Remember, each day brings opportunities for achievement. Through action, we should turn opportunities into achievements, thus bringing fulfillment. Keep your mind clear and do good to everyone you can. Be bold and upright. Stand up for your rights. In life, change is the law, growth is optional, choose wisely. If we as human beings get this message in, we will move on and continue to grow and contribute and take better decisions, which will make all the difference in the quality of our lives. If you want to achieve your goal, keep the road map correct and the journey on the right kind of highway. Choose the right highway and avoid any distractions that come your way. Winners set their own standards! Nobody else sets the goals for them. They internalize the goal. They internalize their own vision, they implement their own vision. They have their own dream. They walk their own dream! Let the criticism come but rise above it if it is useless. But you can’t be away from criticism. All kinds of people will be looking at you and everybody doesn’t know everything about you, and they will interpret it in their own way. Let them! If you feel that every time you take two steps forward someone pulls you back, become aware and conscious that is a negative pull. Become conscious and break away from the pull as soon as you can! So it is about becoming conscious of the environment around you, whats working for you and whats not! Following your passion is living your life, that’s making a life, that’s creating a life and that’s enjoying life! The other is just earning daily wages and becoming hungry again the next day. Being spiritual is rising above pettiness, rising above hostility, rising above people who hold you back and rising above normal negative human emotions. Success is a question of being hungry. But I would link hunger with joy and not hunger with greed. Hunger with share, not hunger with pain. If you are hungry to beat others, to spite others, then you are not getting the joy out of it. It’s a good idea to visualize your goals. If you don’t have self faith, you will always be seeking help, you will always be seeking advice, you will always be seeking guidance, that means you will always be dependent! It’s self faith that makes you stand up, walk straight, progress and also be a big pillar of strength to all around you! Self discipline cuts off lots of distractions, which maybe attractions for others but for you they are a distraction. So if they are attractions for you then you deviate but if they are distractions for you, then you remain focused and reach your destination faster than anybody else does! Make yourself thirsty for what you want. But the key is start searching for it. If you want it, search it! That means just look at yourself and ask yourself what do you want? Anubhav Srivastava is an author, motivational speaker and the director of Carve Your Destiny, a first of its kind inspirational documentary featuring some of the most famous personalities from diverse fields, who teach the viewers how they too can make all of their dreams come true. The movie itself has been seen on Youtube by close to 800,000 people. Anubhav has also been featured in numerous International and India Media outlets such as BBC , The Times of India, Hindustan Times, Rediff.com, Leicester Mercury and many others.